Tube pans come in two varieties: single and double piece sets. Choosing the proper pan for your cake will help you avoid accidents in the kitchen. Leaking commonly occurs when you use the wrong pan for baking a cake. If you only have a single type of tube pan, you can take measures to prevent the pan from leaking batter inside your oven. Look at your tube pan to determine if you have a single-piece or two-piece pan. A removable center indicates you own a two-piece pan prone to leaking. Take a tip from leaky springform pans: line the pan with parchment paper. Place a piece of parchment paper on a surface and set the tube pan on top. Draw the outline of the base of the pan on the parchment with a pencil. Cut this circle out with scissors. Pick up the parchment and place it on top of the pan. Draw a circle corresponding to the central tube of the pan and cut this center out. Place this doughnut-shaped parchment paper in the bottom of the tube pan before you pour in the batter. Ensure that the center piece of the tube pan fits tightly inside the larger part. Cover the exterior of the pan by tightly wrapping the base of the tube pan with a sheet of aluminum foil. Choose the right cake batter for your pan. Bake most cakes and yeast breads in a single piece tube pan. 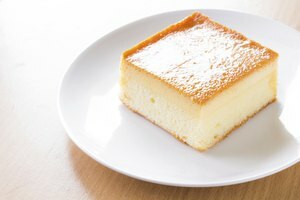 You can make angel food cake and thick foam cakes without the thick batter leaking from between the two-piece tube pan parts. See Resources for an angel food cake that will work in a two-piece tube pan. Place the cake on a baking sheet while baking to catch any leaks from the pan. 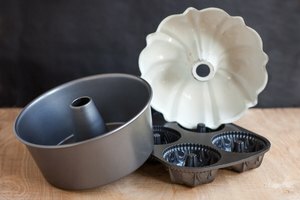 What's the Difference Between a Bundt Pan and a Tube Pan? What Other Kind of Pans Can I Use to Make Monkey Bread?